As the coach slowly inched its way through the police lines the crowd surged forward in a frenzy of excitement, many of them had their faces painted blue and their lips pursed against small blue trumpets that emitted a level of sound far beyond their size; klaxons in cardboard disguise. From where I was standing I couldn’t see the occupants of the vehicle as they disembarked and hurried into the side door to the stadium. All I could see was the sea of arms rising and falling as if the coach was Mecca. Moments later a second coach arrived and the crowd surged again to greet it. From somewhere behind me an egg was thrown which hit the windscreen and exploded against the expanse of glass. Behind the wheel, the coach driver calmly pulled back on the washer lever and the giant wipers moved over and back in the jet stream, clearing all traces of the offending missile. The horns grew louder, accompanied by jeers, and small plastic water bottles began to fly over my head as the first of UD Las Palmas’ players climbed down the steps and walked defiantly slowly towards the stadium door. I was beginning to wonder if I’d made a wise choice in deciding to pay my first visit to watch my adopted homeland’s football team, CD Tenerife, on the day they were playing neighbouring island and arch rivals UD Las Palmas from Gran Canaria. After much dithering about and one short sojourn in the wrong section, I finally found my seat, much to the relief of the faces that had been charting my progress with the same expression that I reserve for those people on an aircraft for whom the seat numbering appears unfathomable, and settled down to enjoy the spectacle. With 20 mins to go before kick-off there was plenty of time to gawp around and take in my fellow spectators. There were family outings with mum, dad and kids all equipped with scarves, shirts and those little blue trumpets which were beginning to get on my nerves. Behind me, a row of pensioners were chatting excitedly and swinging their scarves around over their heads in a manner that threatened to dislocate shoulder joints if they weren’t careful. And then I noticed something really odd; almost every single person I could see was eating sunflower seeds, biting onto the husks and spitting them out before chomping on the seed within. I was fascinated. I suddenly became aware of the ground which was littered with discarded husks and more were fluttering down from the terrace above. Then, as CD Tenerife arrived onto the pitch, blue and white ticker-tape rained down from above, settling on heads and seats and the stadium erupted into cheers and horn blowing, the terraces becoming a writhing mass of blue and white flags and banners. It was an exhilarating experience. Ninety minutes of flares, horns, cheers, referee abuse and excitement. The pensioners behind me made the most vocal noise and swore more than anyone else and the family in front very nearly had their trumpets mysteriously stolen when they went for toilet breaks and more cola at half time. The result was 2-2; a pleasing result for UD Las Palmas and a disappointing one for CD Tenerife. 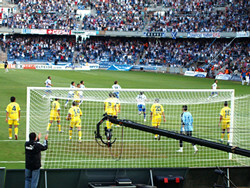 As I made my way to the exit, ankle deep in ticker-tape, I felt I’d discovered another facet to the Tinerfeños; their passion for football, the extent of their rivalry with Gran Canaria and their voracious penchant for sunflower seeds; I can’t see that one catching on at Britain’s football grounds, can you? November in the north of Tenerife usually evokes two strong images in my mind; heavy rain and chestnuts roasting. But last year, and so far this year, only one of those images has transpired. Normally, November is the month in which everything breathes a sigh of relief as the long, dry summer draws to a close and the heavens open to the welcoming arms of the wilting tropical vegetation. Once sated, the earth blossoms anew and the faded colours of summer are replaced by vivid scarlet poinsettias and the bright orange crowns of strelitzias. But as I compile this blog we’re deep into our second calima in as many weeks and, save for a couple of midnight light showers, the temperatures remain resolutely high and the ground solid. The rains may have failed to appear but the chestnuts haven’t. 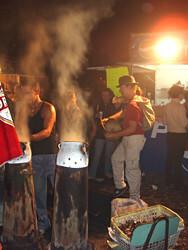 As the sun bids its hazy adieu to the day, the white-out of calima is replaced by the fragrant smoke of a dozen braziers, fired up to white hot and topped with small clay pots in which sweet chestnuts are roasting. When darkness falls, the pyramids of ash beneath each brazier show their fiery hearts and sparks fly from the fires like mini volcanic eruptions. Brows wet, clothes stained with ash while gloved finger and thumb test the chestnuts for readiness, men and women tend the braziers and feed the busy stalls that line the front of the harbour. Small skewers of spicy pork kebabs (pinchos) sizzle on grills alongside wine vats from which the year’s new wine is dispensed in small plastic cups. It’s the prelude to Christmas; from December the lights will be turned on and thoughts will turn to the holidays and preparations for the festivities. But for now, as the fiesta of San Andrés approaches, it’s a time to savour the sweet chestnuts and new wine and to spend evenings on the harbour and in Plaza Charco enjoying the warmth of the bonus summer nights. Tomorrow the rains may come. I used to be a civil servant (that’s another of those sentences that I feel ought to be followed by “but I’m ok now”), so I’m not easily fazed by bureaucracy. But the British Embassy has managed to raise my blood pressure to a level that requires blog therapy to lower it again. My passport expired at the end of September and being no longer resident in the UK I have to apply to the British Embassy in Madrid to renew it. The first couple of points on the blood pressure gauge were notched up when I looked at the fee; the cost of renewing a passport in the UK is £72 (€105), to apply as an ex-pat it’s €185 plus €15 courier costs. I’d already mentally compiled the first few lines of my ‘outraged of Tenerife’ letter to The Times when I spotted the counter-signatory requirements. Even though I no longer reside in the UK, I still have to have my application and photograph countersigned by a UK citizen who is a JP, MP, police officer, established civil servant, doctor, engineer or similar professional person who’s known me for at least 2 years. This is a Catch 22 clause; anyone who’s living here and therefore in a position to counter-sign, cannot possibly be a UK JP, MP, Police Officer etc as they’re no longer resident in the UK. Luckily, my friend Brian was coming out on holiday and being an established civil servant, was able to step into the breach. Of course, I forgot all about the passport in the general fun of having a visitor and it wasn’t until his last day, on an outing to Icod de los Vinos, that Brian reminded me I needed to get a photo for him to sign and so I ducked into one of the many photography studios that they have here in the Canaries and asked if she was able to supply photos for a UK passport. She assured me she was and in 10 minutes the deed was all done and the photos were in my bag. No make-up and hair that should have been washed yesterday resulting in the sort of photograph that’s usually accompanied by a charge sheet and a cell for the night… and it’s going to be with me for the next 10 years. The application was duly despatched the following Monday (photo €3, recorded delivery €1.50, running total now €204.50), and on Friday last week I received a phone call from a courier to come and sign for a package. I was about to forgive all in my astonishment at the efficiency of the British Embassy until I tore open the packet and there was my application form and old passport. They’d been returned to me on the grounds that the photograph didn’t meet their requirements. The eyes were not in the grey band area as illustrated and the crown and chin fell outside of the designated areas as shown. My husband said it’s because I’ve got such a long face and we both wondered how Ruud van Nistelrooy got his passport photo passed. Just to add insult to injury, I’d been charged €15 courier fee for its return (€219.50 and rising). I’m beside myself with rage. I want to pick up the phone and rant at someone but the website tells me that’ll coast me €1.16 per minute and they’ll probably leave me on hold for a fiver or more. So now I have to get another photo (€3.50), send it back to the UK for counter signing (€1.50 plus 2 weeks delay), re-send it to the Embassy (€1.50) and pay again for the courier service (€15). So far, my renewal is estimated at a staggering €242.50 and I’m still a long way from a new passport. On the plus side, I’ll be able to glam up for the next photo but I’ll have to not think about what it’s all costing me or the long face’ll never fit that damn outline. Incidentally, there is NO WAY I’m putting the photo on here to accompany this little tale, I’m taking it to the garden to be un-ceremoniously burned.